"February 23, 2012 – MEXICO – A 5.0 magnitude earthquake rattled the ocean floor 101 km off the coast of Chiapas Mexico. Tension is building along this region of the Cocos tectonic plate, which borders the Caribbean Plate on the East and the Nazca Plate to the South. As the earthquake was 60 km in depth, there were no tsunami or damage reports issued for the region." "EAST PRAIRIE, Mo. — Residents got an early morning jolt Tuesday after an earthquake rumbled at least nine states, causing minor damage and a big stir in the town of East Prairie, near the quake's epicenter. " "We're no strangers to quakes, but this one was different," Brack said. "We had one four years ago and that one rolled. This one was straight underneath us and lasted for 30 seconds or so. It reminded you of lightning"
"U.S. Geological Survey geophysicist John Bellini said the rural farming community of East Prairie is known for its seismic activity. "It's a normal event that occurs from time to time," Bellini told msnbc.com. "It happens every two years or so. They have many that are small but no one can really feel them. Once in a while you will get one like this one that is wider and stronger." Bellini said several people in Missouri, Arkansas, Illinois, Kentucky and Tennessee also reported being awakened by the temblor that happened at 3:58 a.m. GMT. A few residents of North Carolina, Alabama, Indiana and Georgia also experienced some shaking"
"Studies of last year's giant Tohoku earthquake and tsunami in Japan suggest that shaking from a Cascadia megaquake could be stronger than expected along the coasts of Washington, Oregon and British Columbia, researchers reported Sunday at the annual meeting of the American Association for the Advancement of Science." The red dots represent aftershocks from the Japan quake, which roughly trace the area that shook hardest there. Superimposed on a map of the Northwest, the result shows where the strongest ground motion is likely to strike during the next quake on the Cascadia subduction zone, the underwater fault marked by the black line. The green line is the relative location of Japan's subduction zone. "VANCOUVER, B.C. — Scientists are still unraveling last year's giant Tohoku earthquake and tsunami in Japan, and some of what they're finding doesn't bode well for the Pacific Northwest. "The Cascadia subduction zone can be seen as a mirror image of the Tohoku area," said John Anderson, of the University of Nevada." "Anderson compiled ground-motion data from the Japan quake and overlaid it on a map of the Pacific Northwest, which has a similar fault — called a subduction zone — lying offshore"
"The longest record for a subduction zone is from Cascadia, where scientists have linked buried marshes and submarine landslides with a series of about 22 megaquake quakes going back 10,000 years. The time between quakes ranges from 200 to 1,000 years, with an average of about 500 years." "Several of the yardsticks used to gauge the risk on subduction zones were proved questionable in Japan, he added. Foremost among them is the measurement of strain buildup, as reflected by bulging and sinking land masses. Scientists had hoped they could identify fault segments that are about to snap — but the tension on the Japan subduction zone was not remarkable, Mori said. Scientists are rethinking which subduction zones are most dangerous, said Kelin Wang, of the Geological Survey of Canada." "HAWAII VOLCANOES NATIONAL PARK, Hawaii: Scientists at the USGS Hawaiian Volcano Observatory are keeping an eye on a swarm of small earthquakes around the active Kilauea volcano. 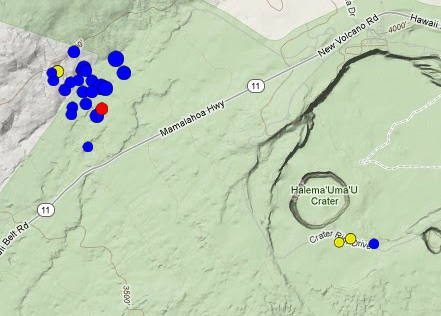 A swarm of shallow earthquakes started after midnight last night about 5 km (3 mi) northwest of Halema`uma`u Crater that was ongoing as of this posting. Forty-eight earthquakes were strong enough to be located beneath Kilauea: 39 quakes within the swarm so far at a maximum rate of 6/hr (including a preliminary magnitude-3.4 quake at 6:56 am), two deep quakes beneath the southwest rift zone, two beneath the southeast summit caldera, one within the upper east rift zone, four on south flank faults. Seismic tremor levels were low and dropped slightly during deflation. Most of the quakes have been in the magnitude 2.0 vicinity, but a few reached over 3.0. Seismic activity on the rift zone is not rare, however this number of small earthquakes is high for the present eruptive activity." "Since yesterday in the press of Shimane Prefecture, Japan, were appeared a reports, that local fishermens near the Oki Islands started to catch a large number of deep-sea fishes, which very rarely seen in this area of the sea. Oki Islands is a group of islands in southwestern part of the Sea of ? ?Japan, which is located 50 kilometers of north of Honshu Island, Oki Islands are part of the Shimane Prefecture, Japan, and are located near the maritime boundary of Japan and South Korea. According to local fishermens, even with the ancient times they believed, that the appearance of deep-sea fishes is a sure sign before the earthquake. It is also possible, that in this area will be revival of ancient volcanoes, as the Oki Islands were formed by volcanic eruptions of Pektusan Ridge, which stretches from Korean Peninsula to the shores of Honshu Island on the bottom of the Sea of ? ?Japan - in recent years have been cases in the world, then awakening an ancient volcanoes." "The 6.8 magnitude earthquake that struck the Tyva republic in Russia’s East Siberia on Sunday will trigger a new series of earthquakes in the region, a Russian scientist said." The previous earthquake with a 6.7 magnitude occurred in December 2011 in the Kaa-Khemsky district of Tyva, some 100 km east of the city of Kyzyl, at a depth of 10 km. The tremor caused no destruction or casualties. The next earthquake was expected to strike closer to Lake Baikal. Normally, a fault that becomes active in one area causes a series of decreasing tremors by their magnitude, he said. “In this case, it is most likely that some neighboring fault became active near the previous one. This means that Tyva will now be rattled by two series of earthquakes simultaneously,” he said. Siberia quake home vid... Not to impressing. The Siberian Traps are considered to have erupted via numerous vents over a period of roughly a million years or more, probably east and south of Norilsk in Siberia. Individual eruptions of basalt lavas could have exceeded 2,000 km3. The giant Norilsk-Talnakh nickel–copper–palladium deposit formed within the magma conduits in the main part of the Siberian Traps. The presence of extensive tuff and pyroclastic deposits suggests that a number of large explosive eruptions occurred during or before the eruptions of basaltic lavas. The presence of silicic volcanic rocks such as rhyolite is also indicative of explosive eruptions. Is this the same area that the earthquakes are occuring? "February 27, 2012 – FRANCE - The earth shook in Crévoux, 16 km northeast of Barceloneta, tonight at 11:37 p.m. accurate, according to the website of Atomic Energy Commission (CEA). The earthquake measuring 4.9 (4.7 USGS ) on the Richter scale was felt in the Var, Alpes-Maritimes and even Marseille where many people reported they felt the tremor for 3 to 4 seconds. It is the strongest earthquake to hit the region of the Hautes-Alpes since 1997. –La Provence"
"A shallow 5.9-magnitude earthquake sent people fleeing onto the streets in Taiwan's second-largest city of Kaohsiung and led to temporary halting of rail services.No casualties were reported yesterday. The quake struck 57 kilometers east of the southern city at 10.34am at a depth of just four kilometers, the US Geological Survey said. The Hong Kong Observatory measured the quake at a magnitude of six, while Taiwan's Seismology Centre put it at 6.1. Taiwan is regularly hit by quakes as it lies near the junction of two tectonic plates. In September 1999, a 7.6-magnitude tremor killed 2,400 people in the deadliest natural disaster in the island's recent history. AGENCE FRANCE-PRESSE"
"Five tremors shook the island between 07:04 and 09:32. One resident described a very deep, loud rumble. The British Geological Survey recorded the strongest at a magnitude of 2.8. A spokeswoman said there were no reports of any damage. A further four small earthquakes have already affected the area this month, reaching up to a magnitude of 2.6." OKLAHOMA -- Just Wednesday afternoon, a 3.0 magnitude earthquake shook the central Oklahoma town of Wellston. Experts tell us the state experienced more than 1,000 quakes last year, with tremors felt by more than 60,000 people across Oklahoma and surrounding states. Seismologists saw a big jump in the number of earthquakes in Oklahoma last year. More than 1,000 quakes were recorded in 2011 -- ten times the average number of 100 a year. Last year also produced the strongest quake in the state's history -- a 5.6 magnitude tremor in Lincoln County -- in November. Oklahoma Geological Survey Seismologist, Austin Holland says it's uncommon to see the number of earthquakes jump so drastically. "It's a little unusual, to see this large uptick, some of that is due to the fact we have more seismic instruments in the state, so the more you listen, the more you're gonna hear," Holland said. A 4.5-magnitutude earthquake has struck off Kamchatka’s east coast in the Avacha Bay. There was no destruction, casualties or a threat of tsunami. The center was in the area of Shipunsky Cape 140 kilometers northeast of Petropavlovsk-Kamchatsky. Its center was at a depth of 40.2 kilometers under the seabed. Brief earth tremors were felt in some districts of Petropavlovsk-Kamchatsky. Seismologists say a 7-magnitutude earthquake is likely in this area within a month. If its center is in the Vacha Bay, the strength of tremors in Petropavlovsk-Kamchatsky may reach 5-6 points. At the same time specialists say that “such seismic events occur in Kamchatka once in three-four years and there is nothing out of the ordinary about them.” Earthquakes that strong were registered in the main city of the territory at the beginning of March 1992, the beginning of June 1993 and in December 1997. None of them caused heavy destruction. "A strong 6.6-magnitude earthquake hit south-east of the Loyalty Islands in the French Pacific territory of New Caledonia late Saturday but there was no tsunami alert, seismologists said. The quake struck 260 kilometres east-southeast of the town of Tadine on the island of Mare at 11:19 pm (local time) at a relatively shallow depth of 15 kilometres, the US Geological Survey said. USGS initially measured it at 6.9 but later revised it down to 6.6. Geoscience Australia gave it an initial magnitude of 6.7 at a depth of 46 kilometres and estimated that it was unlikely to have caused damage. There was no threat of a widespread destructive tsunami from the tremor, which hit about 400 kilometres east of the New Caledonian capital Noumea, the Hawaii-based Pacific Tsunami Warning Center said. "However earthquakes of this size sometimes generate local tsunamis that can be destructive along coasts located within a hundred kilometres of the earthquake epicentre," it said. There were no immediate reports of damage or casualties from the sparsely populated and remote Loyalty Islands. New Caledonia lies on the so-called "Pacific Ring of Fire", a zone of frequent seismic activity caused by friction between shifting tectonic plates." "A series of moderate to strong earthquakes has rattled several parts of the globe including Iran, China, the Philippines and parts of the South Pacific in the past 12-24 hours." "The strongest of the recent quakes was centered near Vanuatu, where the quake was recorded at a magnitude of 6.7 by the USGS"
"An earthquake has struck the far west of China but there were no immediate reports of injuries or damage. The U.S. Geological Survey said Friday that the 5.8 quake struck about 7 a.m. (2300 GMT) in the southern part of Xinjiang region. An official from the Communist Party Propaganda Department in Luopu county, where the earthquake hit about 175 miles (280 kilometers) northeast of Hotan, said the epicenter was in the desert and no reports of injuries had been made. 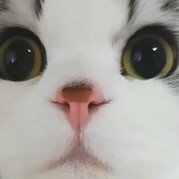 The official refused to give his name. The USGS put the quake's depth at 22 miles (35.5 kilometers)." "A year on from one of the biggest earthquakes in recorded history, Japanese scientists are warning anew that Tokyo could soon be hit by a quake that will kill thousands and cause untold damage. Greater Tokyo, home to 35 million tightly packed people, has seen a three-fold increase in tectonic activity since the magnitude 9.0 undersea quake that unleashed a killer tsunami last March. Every day, an average of nearly 1.5 quakes are recorded in and around the city, one of the most populated places on Earth. But Tokyoites are so used to being shaken in their beds or at their desks that the majority pass almost without comment. The city is, without doubt, one of the most earthquake-proofed places in the world. Even the monster quake of March 11 last year that struck just 370 kilometres (230 miles) away caused little structural damage." Figures compiled by the ABC reveal that since the massive earthquake in Japan a year ago the country has been rattled by more than five times as many tremors as usual. That includes 10 aftershocks of magnitude seven or greater. "Just over one year ago, a magnitude-9 earthquake hit the Tohoku region of northeastern Japan, triggering one of the most destructive tsunamis in a thousand years. The Japanese—the most earthquake-prepared, seismically savvy people on the planet—were caught off-guard by the Tohoku quake’s savage power. Over 15,000 people died. Now scientists are calling attention to a dangerous area on the opposite side of the Ring of Fire, the Cascadia Subduction Zone, a fault that runs parallel to the Pacific coast of North America, from northern California to Vancouver Island. This tectonic time bomb is alarmingly similar to Tohoku, capable of generating a megathrust earthquake at or above magnitude 9, and about as close to Portland, Seattle, and Vancouver as the Tohoku fault is to Japan’s coast. Decades of geological sleuthing recently established that although it appears quiet, this fault has ripped open again and again, sending vast earthquakes throughout the Pacific Northwest and tsunamis that reach across the Pacific." "What happened in Japan will probably happen in North America. The big question is when." The "ghost forest" of dead cedar trees at the Copalis River on the Washington coast is evidence of a major quake three centuries ago. "SRINAGAR: Two earthquakes of moderate intensity shook Kashmir Valley within three hours today but there were no reports of any casualty or damage." "An earthquake measuring 5.6 on the Richter Scale rocked Northwest Kashmir at 1136 hrs," an official of the Disaster Management Cell said." "He said the epicentre of the quake was in Gilgit area in Pakistan. Another tremor measuring 4.5 on the Richter Scale was experienced at 0156 hrs, the official said. The two quakes caused panic but there were no reports of any casualty or damage to property, he said. Pakistan-occupied Kashmir and areas of Kashmir valley along the Line of Control, located in highly active Siesmic Zone V, were devastated by a 7.6-magnitude temblor in October 2005. "The monster quake killed over 75,000 people in PoK and 1300 in the Valley"
The Earthquake Unit at the Mona Campus of the University of the West Indies says tremors from a magnitude 5.0 earthquake that occurred in Cuba this morning were felt in several parishes in Jamaica. "This is the second earthquake felt in Jamaica in consecutive days following the 3.4 magnitude quake recorded near Yallahs, St Thomas, yesterday. A release from the unit says this morning’s earthquake occurred at 3:34 and was felt in Clarendon, St Catherine, St Mary and Kingston and St Andrew. The epicentre of the earthquake was in the Santiago de Cuba province. " "People in the New South Wales Snowy Mountains are reporting what they say is an earth tremor. Residents at Jindabyne say the earth was shaking around the Kalkite area, on the shores of Lake Jindabyne early this morning. Jim Crocker from the Jindabyne township says the tremor took him by surprise. But he says earth movements are not uncommon when the lake is full." I am just going to list earthquaakes and then give the links for them..
"An earthquake measuring 3.5 on the Richter scale was felt in western Uttar Pradesh and parts of Delhi and the NCR on Tuesday. The earthquake took place at around 3.37 am. No serious damage has been reported. An official from the Meteorological Department (IMD) said it was a low intensity earthquake with the epicentre at Baghpat in western Uttar Pradesh. This is fifth tremor experienced in Delhi since the beginning of this year. On March 5, a 4.9 magnitude earthquake had shaken Delhi and its adjoining areas in the NCR. Its epicentre was Bahadurgarh on the Haryana-Delhi border." "A small tsunami wave has hit Japan's northeastern coastline, officials say, after a strong earthquake rocked the region a year on from the country's worst post-war natural disaster. Today's 20cm wave and 6.8 magnitude quake, which struck around 210km off the northern island of Hokkaido, prompted local authorities to issue an evacuation warning for coastal residents before it hit land. Japan's meteorological agency also confirmed that an earlier 10cm wave had hit land. The waves hit two locations in Aomori prefecture, which was one of the areas in Japan's northeast devastated by last year's disaster. The agency had initially said a tsunami could be as high as 50cm, but US monitors said there was no Pacific-wide tsunami threat. The quake struck at a relatively shallow 10km below the seabed at 6.09pm local time (8.09pm AEDT)." "Residents in a small southwestern New Brunswick community may continue to feel minor earthquakes for several more days or even weeks, according to a Natural Resources Canada seismologist. McAdam has been hit with five small earthquakes since Saturday in what is known as an “earthquake swarm.” The last one was felt at 7:30 p.m. Tuesday. “Certainly we are seeing what we are calling an earthquake swarm,” said John Adams, a seismologist with Natural Resources Canada. The first earthquake happened at 1:40 a.m. on March 10, which had a magnitude of 2.4. Three minutes later, an aftershock with a magnitude of 1.4 was recorded. Two more earthquakes were recorded on Tuesday within roughly 20 minutes of each other. The small quakes had magnitudes of 2.0 and 1.9 respectively. A third quake was felt at 7:30 p.m."
"SYDNEY — A 6.4-magnitude earthquake struck Papua New Guinea Thursday, the US Geological Survey reported, but a tsunami warning was not issued and seismologists said "no major human impact is expected". The quake hit the New Britain region at 7:13 am (2113 GMT Wednesday) at a depth of 48 kilometres (30 miles), 204 kilometres southwest of the main city in the area Rabaul and 598 kilometres from national capital Port Moresby. Geoscience Australia, which put the depth at 103 kilometres, said the quake may have been felt as far away as Port Moresby but "no major human impact is expected"." "MANILA, Philippines (AP) -- Officials say a 5.9 magnitude earthquake in the southern Philippines has caused minor damage and a mall stampede, leaving at least 23 people injured. Philippine Institute of Volcanology and Seismology chief Renato Solidum said Friday's quake was centered 2 kilometers (1.2 miles) off Dinagat Island near southeastern Surigao del Norte province. No tsunami alert was raised. Surigao del Norte Gov. Sol Matugas says in the provincial capital Surigao City, 20 people were injured in a stampede at a mall packed with shoppers"
This is just a throw in of a 3D Earth and current Quake data shown as the Earth rotates. A powerful earthquake Tuesday that centered along the Pacific coast of southern Mexico occurred in a region with a history of unleashing damaging jolts, scientists say. Since 1973, the seismically active coast has been rocked by 15 major quakes magnitude-7 or larger. The deadliest occurred in 1985 when a magnitude-8 struck, sending shock waves to Mexico City that killed thousands." "March 20, 2012 – WORLD – Two major earthquakes have struck the world within 6 minutes of each other. The earthquakes were a deep 6.2 magnitude earthquake near Papua, Indonesia and a much more shallow 7.6 magnitude earthquake which struck about 17.5 km (10.9 miles) deep near Oaxaca, Mexico. The Mexico earthquake’s epicenter was about 186 km (115 miles) from the popular resort area of Acapulco. –The Extinction Protocol"
"SINAIT, Ilocos Sur, Mar. 18 (PIA) -- Three mild quakes rocked some areas in Northern Luzon on Saturday afternoon and this morning but no damage to properties was reported, the PhilippineInstitute of Volcanology and Seismology (Phivolcs) satellite office here said. Phivolcs said that a 3.2 magnitude tremor happened at 7:10 a.m. Sunday with epicenter at 69 kilometers northeast of Laoag City in Ilocos Norte with a depth of 85 kilometers. It was reported that no intensity and aftershocks were recorded." The feeling I get on this is that they knew ahead of time that it was highly likely, not necessarily pre planned. They all know about the 188 day cycle so naturally they could plan a drill. What troubles me is knowledge of the location. By what variables did they determine that, since amongst the line no other exercise was being held.